Team Anyare (pronounced as an-ya-re) is composed of Marte Soliza and Beato Bongco from the Philippines. 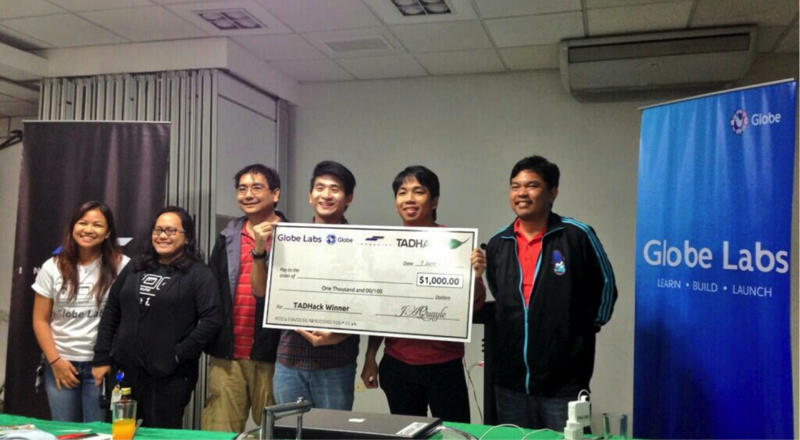 They are the winners of TADHack Philippines. You can see more on TADHack Philippines in this weblog. Marte is the CTO of Insync and a veteran of hackathons and code jams, having won various awards over the years. Beato is a recent Information Systems graduate who had done some freelancing gigs while in college and, unsatisfied with corporate minutia, found himself working for Insync, where he eventually developed a passion for web development. Create a group. Add your members’ cellphone numbers here. Set a time. At the appointed time, everyone in the group will receive a voice call asking a survey question. (e.g. “What did you do today?” or “Were there any problems?”) Questions can be changed by the creator of the group. Answers are recorded. Listen to answers. Call up the app to hear everyone’s responses or go to the website and check out the archives. SMS messages can be sent to everyone in a group to help facilitate communication also. The app has a geolocation feature using the telecom’s API which allows members to see where other members are. You don’t need a GPS capable phone. The idea for this app came when Marte and Beato discussed the real world communication problems in third world countries. In the Philippines, finding a stable internet connection in rural areas is a small miracle. Cellphone signal, however, is usually no problem even when in far-flung areas. They thought about the people who need to travel all over the Philippines as part of their jobs. Some are tour guides, wildlife preservation teams, rescue teams, park rangers, field scientists, on-site inspectors, and even corporate teams who need to keep a constant line of communication. How do they make their lives less difficult? They thought about which medium of communication was “always on”. PC and laptops aren’t. Most of the time they’re too heavy to have with you 24/7. They thought of how they would make it accessible to the broadest audience possible. The answer is cellphones. They could take advantage of the current available mediums: voice calls and SMS. So they made a telecom app. Android, Apple, Windows or an analog phone, telecom apps will work on almost anything that can be considered a phone. Thus Anyare was born. With it, once you set everything up you don’t need internet or even a laptop to keep in communication with your team. You just need what most people have, a phone, over 6B people of the 7B people in the world can be directly access by a mobile phone. Internet penetration reaching that ubiquity is more than a decade and even then there will not be one ubiquitous communications app like there is in telecoms. Most of the app’s code is done but due to some issues with the current technology, making the app compatible with all service providers in the country is a little tricky. It currently works with Globe (a leading service provider in the Philippines) who also provides the telecom app API (GlobeLabs API). They used Flask, a python web microframework, React.JS for the front-end and MySQL for the database. Once the kinks are worked out, they hope to see Anyare out in the field in the near future, helping teams communicate everywhere across the Philippines. They made a video on the day of the pitch which explains some benefits of the app as well as some of its use cases. If you find the audio is a little bit difficult to hear, you can turn on captions for some subtitles. On TADHack Marte and Beato found it a challenging, fun, and unique experience. “I think TADHack is an important event, not only because it is a global competition but because it draws attention to telecom apps. While the world is rushing towards internet dominated apps and services, they are ignoring the cheap and ubiquitous medium of communication which can be of huge help, especially to developing countries. TADHack helps bring this fact to a global audience.” Explained Marte. “It was my first hackathon experience and I can say I thoroughly enjoyed it. It the first time I ever stayed up more than 24 hours programming. It was exciting working with new technology and thinking of novel ways to utilize and shape an existing service into something that could benefit people. I will definitely be joining more hackathons after my experience with TADHack.” Beato said with great enthusiasm.